Partner Spaces are how you share data outside of your organization, i.e. with customers, suppliers, manufacturers, etc. 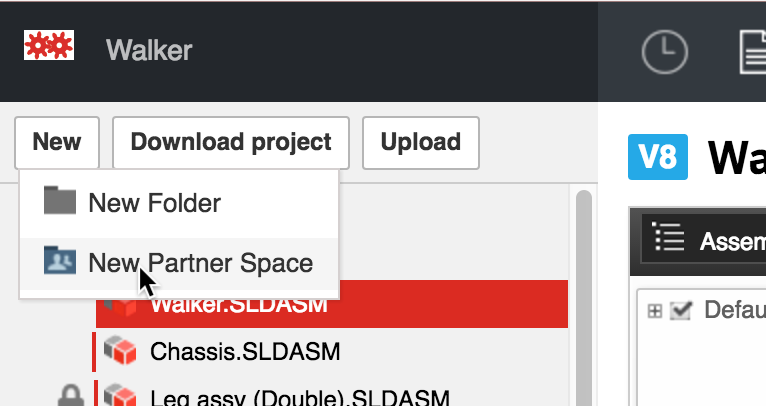 Partner Spaces are like a virtual folder where you can share selected files with your partners without sharing anything else in the project. Here's a quick video explaining more about Partner Spaces, or if you prefer to learn by reading, read on below. With a Partner Space, you are sharing a particular version of the file. 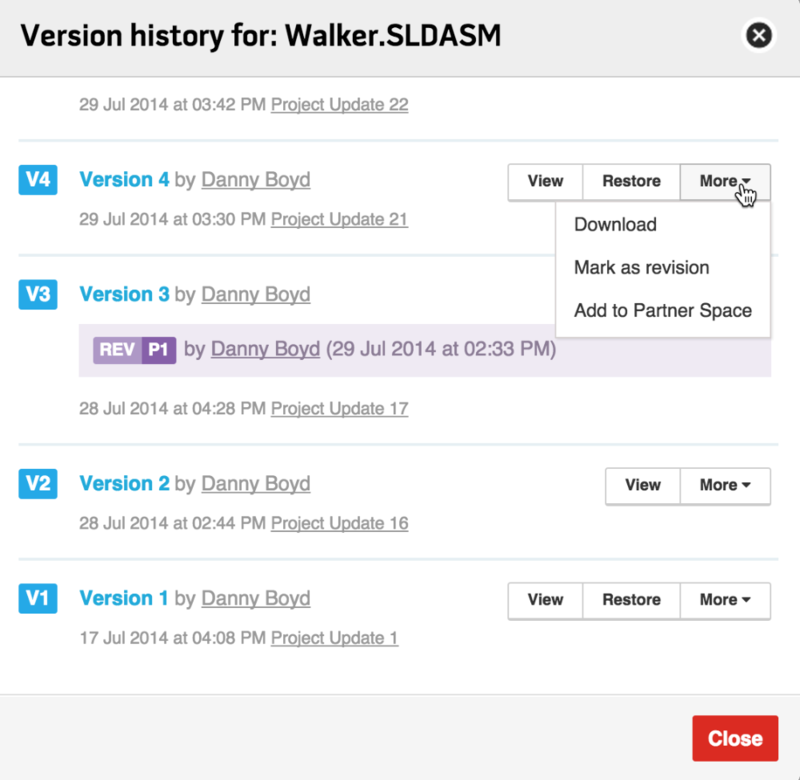 You and your team can continue to update the project with new versions of files after they've been added to a Partner Space, and the Partner Space will remain at the same version as when you added it. Only when you "Update" the Partner Space are the new versions of the files added. For example, if you are making a molded plastic case and want to send it for prototyping, you simply drag the file you want to prototype into a Partner Space and then add your plastic injector as a partner. If you dragged a file at version 11, and a few days later you test out some experimental changes to your case, thus creating versions 12 and 13 in Workbench), your manufacturer doesn't see version 12 and 13, he continues to only see version 11. When you've finalized your design and you're ready to send that to your manufacturer, you can then drag the same file, now at version 15, into the Partner Space to update the file in the Partner Space. Your manufacturer will receive an email notification that there are new files in the Partner Space ready to download. You can read more about versions and revisions here. From the “Files” tab, click the “New” button, and then click “New Partner Space” from the drop-down. Give your Partner Space a name, and then click “Create”. You can also add files to a Partner Space from the Version History window, where you have the ability to add old versions of files, along with their assembly components, if necessary. There are two easy ways to invite partners into a Partner Space, via email invite (most secure) or via link (simplest). From within the Partner Space, click the “Add Partners” button. Add the email addresses of the partners you would like to invite. 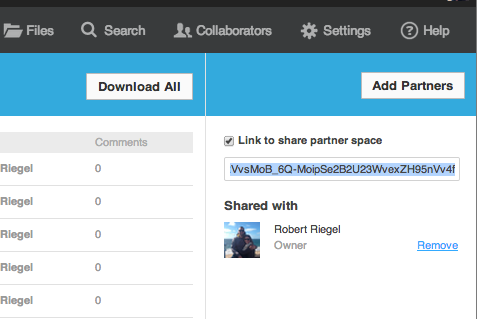 To remove partners, click the “remove” link in the Partner Space next to their name. This method is often more convenient, but is slightly less secure because if you send it to a Partner and they forward that email to someone else. the link will work for that second person. However, you can always turn off the link by unchecking the box. 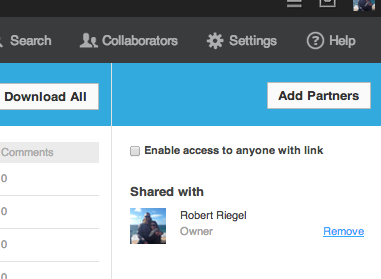 From within the Partner Space, click on the “Link to share partner space”. Copy and send the link to partners. Anybody who has this link can access the Partner Space and the associated files. To turn off the link, uncheck the box. To see what your partners see: copy this link and paste it in a private browsing or incognito window. 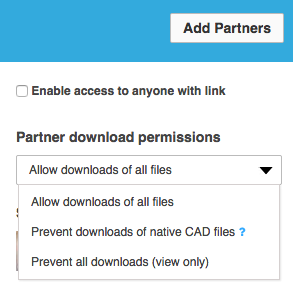 Check this box to allow partners to upload files to the Partner Space. Only invited partners can upload files. Anonymous users cannot add files. To bring these files back into the project, a Project Owner or collaborator must download them and then upload them to the project.